Backed by a team of knowledgeable engineers, we are capable of providing CAD services and other engineering services to the clients. We have good setup with latest 3D & 2D software .We are providing Solid modeling , Surface modeling, Sheet metal and other 2D & 3D modeling/detailing services . Owing to our massive industry experience and vast understanding in this arena, we have been successful in offering Surface Modeling Services. Rendered with perfection, these offered services are broadly acclaimed and recommended for their timely finish, effectiveness and reliability. Additionally, we assure delivering these as per our patrons’ needs and modify them as well. We have attained wide reputation in the market by providing best in class Surface Modeling Services. Surfacing and solid modeling activity are carried by a team of engineers, after white light scanning of the physical part. Rendered by us in user-defined specifications, the quality of these modeling services can be customized. Service description We offer services of Technical Surface Modeling for parts having intricate 3D contours which can only be defined by building the shapes in virtual surfaces & creating a closed volume from such surfaces to get 3D solid cad geometry. Some of our earlier finished projects include Front cabin trim parts, forging dies, cast components, Woofer body parts etc. The freeform surface modelling, A heaven for Designers. We offer services of Technical Surface Modeling for parts having intricate 3D contours which can only be defined by building the shapes in virtual surfaces & creating a closed volume from such surfaces to get 3D solid cad geometry. Some of our earlier finished projects include Front cabin trim parts, forging dies, cast components, Woofer body parts etc. Our services for Solid Modeling and Surface Modeling is offered through 2d drawings, sample measurements and extracting the 2d drawing associated to solid model vice versa. 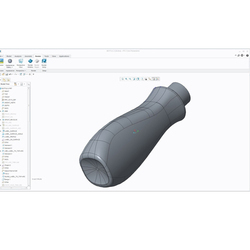 We are also engaged in offering surface modeling through scanned cloud data as well as foreign cad data like, iges, stp and 3d wireframe data. For parts having intricate 3D contours which can only be defined by building the shapes in virtual surfaces & creating a closed volume from such surfaces to get 3D solid cad geometry. If you have 3D models that need visualizations for marketing or for checking aesthetic qualities, we can do that too. We can also offer a surface modeling service if your solid modeling package cannot produce the organic shapes that your design requires. A cavity / core splitting service is also available.